For many years the Philadelphia Cheese Steak shop occupied a triangle corner on busy Madison Avenue on Seattle's Capitol Hill. It seemed to do well but changed hands a few times and gradually did the restaurant slow decline dance. Meantime, just up the street the Bottle Neck bar opened and soon became a favorite hang out. When Philly closed, the proprietors - Erin Nestor and Rebecca Denk - grabbed the additional space and opened a nice neighbor burger joint. They called it "Two Doors Down" because, of course that is where it was. Sometimes naming businesses and productsis easy but often it is a long laborious chore. Who knows how the new restaurant got its name, but it is brilliant, memorable and fun. That fits the new decore and the food. Halloween heavy traffic raced past Two-Doors, just as traffic always does, but ahead on the trek home cars were slowing and some pulling over to grab a burger. All because someone, maybe the genius who named the restaurant, created a cheap but compelling reason to drop into the restaurant. 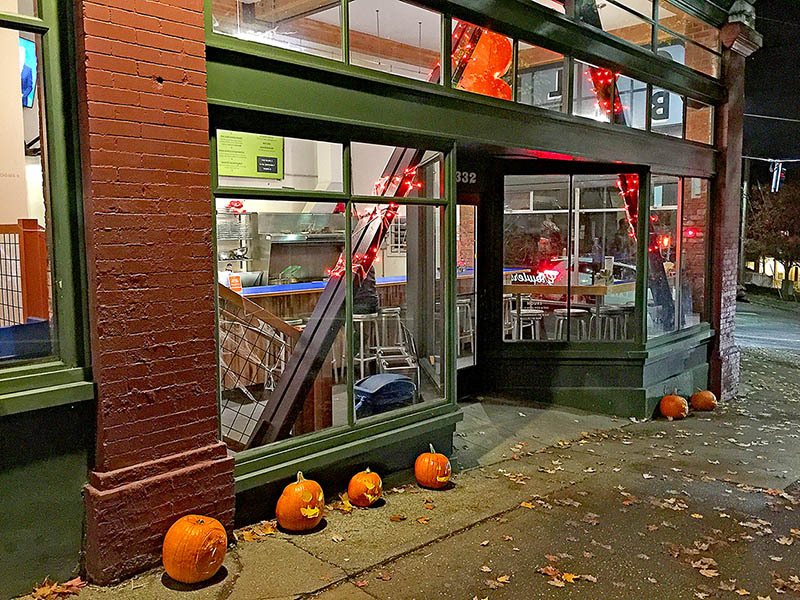 Putting the pumpkins in the window would have worked, but simply putting them on the street made them impossible to miss. On this rainy dreary night. It was warm. It was compelling. They must have sold far more burgers that night because who could resist? Accepting expensive solutions from advertising experts can produce great results, but advertising is always trial and error no matter how well researched. On the other hand, creative thinking always wins over new customers, makes existing customers smile and makes the cash register ring.